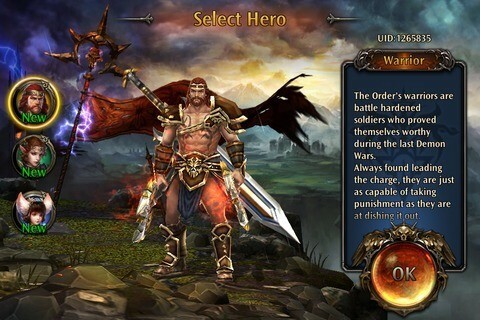 Eternity Warriors 4 is a hack-and-slash RPG developed by Glu games. 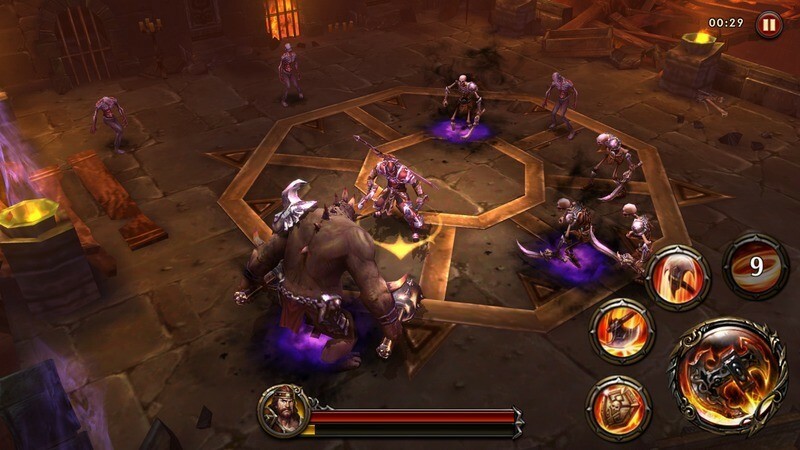 This epic dungeon crawler has plenty of challenging levels, gruesome monsters and huge bosses. Eternity Warriors is a modern-day mobile RPG, but if you want to play a game that’s reminiscent of classic role-playing games, you should try Dungeon Monsters. Read our guide to know more. The game has unique “Star Map” and blacksmith that can help your hero become more powerful. While the core gameplay revolves around increase a hero’s Power Score (PS) and upgrading items, there are other aspects that may help you defeat bosses and monsters faster. The skills shown on the bottom right corner of the screen play a very important role in battle. In most occasions, I tap on a skill soon after the cool down time is over. In most battles, especially boss fights and fighting multiple enemies, around 70 percent of my attacks from skills. In the skills section, use the first three skills starting from the top to unleash maximum damage to a group of enemies or a boss. The top skills are the ones that inflict more damage than others. Some of them may also have a longer cool down time so you may have to wait a few more seconds before using them. Keep an eye on them and immediately tap on a skill as soon as you see it become active. Inflicting and receiving damage increases the rage meter. Once it charges up, a new fiery, glowing skill is displayed at the top. Use it against a multiple of enemies. Some “rage” skills can do more damage if you tap multiple times on the screen (example: Assassin’s skill that appears after rage meter charges up). Save the rage skills for multiple enemies surrounding your hero or for the boss. Keep upgrading active skills as soon as you find a scroll or a tome. Passive skills activate automatically once an active skill or an action is completed. A passive skill also needs to be upgraded to get an optimal defense and attack advantage. You can take an ally with you to battle if you want to defeat monsters and bosses faster. However, the game randomly chooses allies for you. Because of this randomness, there’s no guarantee that you will always get a higher PS ally. Sometimes, the AI displays a set of high power score allies and sometimes, low PS heroes are displayed. Winning a harder mission with a low PS ally is tough. However, you are in luck if all allies have high power score. As you progress through missions, a high power score requirement will play a crucial role in battle and having an ally with a good PS can be a big help! Many times, the game will throw a mix of allies – different types of classes, each with a different PS number and level. Choose the one with a high PS score and/or a level. You may also select a class who you think could be a perfect battle companion. So if your character class is warrior, you may choose a mage or assassin. If your character class is assassin, you may choose a mage to inflict devastating magical attacks to enemies. And if your character class is mage, then an assassin or a warrior can prove to be a good companion. Always send friend requests to stronger allies that have helped you defeat all monsters and bosses until the end. Most will accept your friend request. 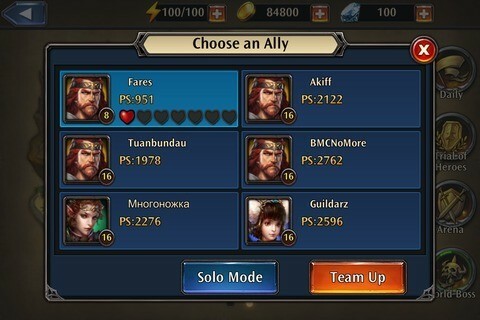 Your friendly ally may also appear in the random ally list, so you can take him/her to battle. Another benefit of having an ally as your friend is that you two can send energy to each other. Tap on the handshake icon and tap on the energy icon to send energy to your friendly ally. As you complete more levels and collect loot, your inventory will fill up faster if you do not remove unwanted items. Get rid of those items that can decrease your hero’s PS and weaken weapons and stats. 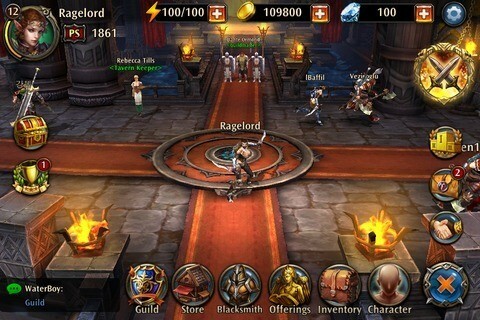 But before selling an unwanted item, tap it to see whether it can be broken down into relic shards or can be reforged. The “Reforge” option should be used on items once you have received the required hammer. You can then reforge an item to increase its stats and PS. Breaking down items will give you relic shards, which can be used to make more powerful weapons and armor at the blacksmith. Once your character reaches level 12, the blacksmith opens a set of new weapons and items for you. The unwanted items that have been broken down to make relic shards can then be used to purchase a more powerful weapon or item. However, the new weapon or item might not be immediately equipped as they may require a higher-level hero. You can check out what level your hero must reach to equip a high-quality item created at the blacksmith. All you need to do is go to inventory and tap on an item to know more about it. Keep playing new and old missions to get more items, and break them down into shards. In case you don’t have items that can be converted into shards, make offerings or tap on the Trophy icon to see a list of tasks that need to be completed to get a common or rare relic shard. Enchanting items is one great way to make your weapons and items stronger and increase your hero’s power score. Each time you level-up your character, you stand a chance to enchant your equipped items. In most occasions, you will need coins to enchant an item. But sometimes, you will need materials to complete the enchantment procedure. To enchant an item after your hero levels up, tap “Character” > “Enchant” and look for the arrow mark beside each item. If the arrow’s color is green then you have all the materials or coins to enchant that particular item. However, an orange arrow indicates missing materials. 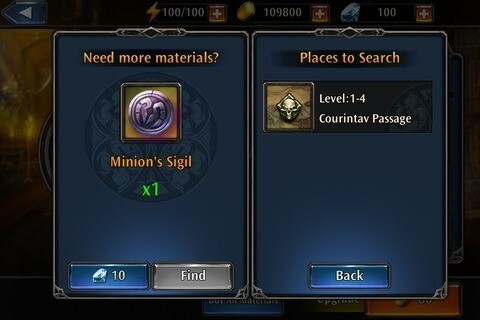 To find the materials required for enchanting an item, tap on the material profile pic and press “Find”. The game will show “Places to Search” i.e. levels that may grant the required material after completing them. You may have to replay and win an old mission to get some materials. Winning previously completed mission is easy as your character’s skills and weapons/items will be powerful for an old mission, so chances of earning a material is higher if you replay such missions. In Eternity Warriors 4, the Star Map lets you make your hero more powerful. You will need star stones, which can be inserted on empty slots of a star map or constellation. Inserting a Star Stone in a socket of a constellation and upgrading it is a great way to increase your hero PS. You will need 5 stones of the same type to upgrade a star stone to increase PS. There are different types of stones, such as attack defense etc. Each star stone type gets unlocked once your hero reaches a particular level. You can get star stones by completing Daily Dungeon “Scavenger” missions. Star stones can also be acquired via Daily Rewards. Make sure you login daily to get them. 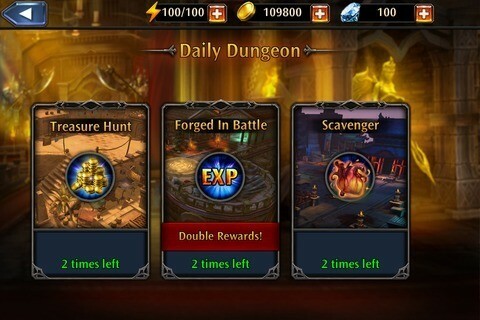 Daily dungeons not only let you earn extra rewards, but also help you level-up your character faster. Leveling up a character has its own benefits – you can equip higher-level items, plus it opens the door for item enchantment opportunities. It also increases your hero’s power score by some points. The first Daily Dungeon only lets you earn coins, but as soon as your character reaches a higher level (above 10), a new Daily Dungeon will appear. Keep an eye on Scavenger Dungeon missions as they will grant common or uncommon materials, scrolls and star stones and many times doubles your reward. 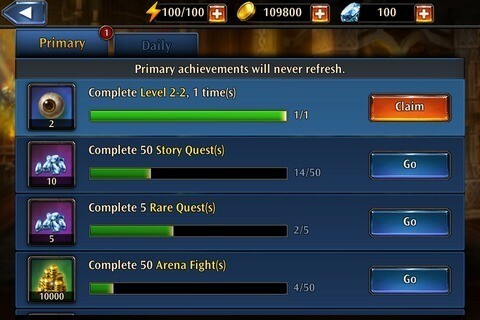 There’s also the EXP Daily dungeon that rewards more XP and also doubles the XP earned after completing a mission. You should also play previously completed levels to get key materials required for enchanting items. Playing older missions is a sure-shot way to level up your character faster. The trophy icon on the left side of the screen displays a list of achievements and tasks required to complete them. A number above the trophy icon shows that an achievement is complete. To find out what tasks are required to complete to earn an achievement reward, tap on the trophy icon at the top of the screen and look at the profile pic beside each achievement. Most of the times, its gems, hammers, coins or materials. In the beginning I got a lot of materials which helped me enchant my items to max level. Keep an eye on achievements and you never know what you may get after finishing them. Although you can select a new hero any time (on your home screen, tap on the gear icon at the top right corner of the screen and press “Change Hero”), stick to a hero you think would be a better choice in defeating multiple enemies or bosses. For me, it was assassin as she is swift footed and some of her skills are pretty awesome. My second choice of course would be warrior, but then he is a tad slower than the assassin. The assassin has some great active and passive skills up her sleeve and she does not waste any time in using them against enemies once I tap on an active skill. You may have your own hero choice and may disagree with mine, but just make sure you are comfortable with his/her attack style and skills. Winning levels in Eternity Warriors IV is all about having a higher PS or Power Score and upgraded skills. Nowadays, such score systems can be found in most mobile RPGs, such as Star Wars: Uprising. You must meet the recommended score and may even need a higher score if you want to stand a chance to give a tough fight to your enemies. Equip your hero with stronger items – the ones that have a positive number (in green) beside them. You don’t have to choose new, powerful items received as loot manually. Just press the “Equip All” button whenever it appears and watch your hero’s PS increase. The AI chooses only those items that have a higher value than the currently equipped items. Play more levels to get high-quality items as loot. The better your rank at the end of a level, the more the chances of getting high-quality loot. Make sure that you don’t take damage to improve your rank. Enchant items. First level-up your character and then upgrade item enchants until they max out to increase the overall PS score. Many times, you will require a set of materials first to complete the enchantment process. The materials can be found scattered around different types of levels. Break down unwanted items into shards and spend them to create a new and powerful item at the blacksmith. Once created, you can equip your character with that item (needs to reach a particular level before you can equip it) and increase your PS. Play Daily Dungeons and level-up your character. Once leveled up, there will be a slight increase in your total PS. Offerings to God of Iron are usually free, but not always free. When free, tap on the glowing Offerings button and tap on the “Free” button to get a high-quality item. Chances of earning an uncommon item are more. You can buy multiple Iron God offerings by paying gold. Equip the item received from the God of Iron if it shows a green up arrow button, which means its stats are higher than the currently equipped item. This is another way of increasing your hero’s PS. Leveling up active and passive skills increases attack damage, total seconds, speed and other attributes. Your character must reach a certain level before you can upgrade a particular skill. But that’s not all – you will also need tomes and scrolls to complete upgrade. To get them, all you need to do is go to “Skills” (Under Character), and tap on the tome or scroll profile pic at the bottom. Next, tap on “Find” to get a list of locations, i.e. levels where you can get a tome or scroll after winning a level. You will need more than one tome, so, you will have to replay a mission multiple times to get all required tomes. You may also have to replay old missions to get them, and as I said earlier replaying old missions will be easier as you will be having more powerful, upgraded skills, enchanted items as you advance through levels so previously-played missions will be a piece of cake as win requirements won’t be as heavy as new levels.